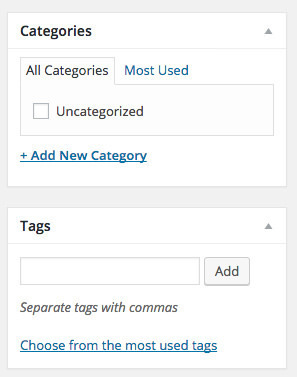 Out of the box, WordPress provides two primary content types for you to work with: Posts and Pages. If you read blogs or have ever written for a blog before, the concept of a post is probably a bit familiar. Posts might be what you use to share your regular thoughts, reflections, or ideas about a topic. Posts make up a kind of "river" of content that you're producing as part of your blogging activity and they often appear on your blog in a regular or scheduled way. They usually are presented on your site in reverse chronological order. Pages usually correspond to our more traditional concept of what makes up a website. Pages are presented outside of the "river" of content that are posts. They are more likely to stand alone and be organized according to a fixed hierarchy. Pages might be content that is less frequently updated or changed. For example, most sites have an About page that gives some general information about the site and is rarely changed. If you were using WordPress to build a business Web site with a lot of static content about the business, you would probably use pages. If you added a feature to that site where you started to advertise special events or news, you would probably use posts. If you want your content to be accessible to your users via RSS/syndication, you'll need to use posts. By default, pages do not appear in a site's RSS feed.